The Things I Do for Love: BDJ Passion Series: Get Gorgeous! It might not be obvious but I like makeup! I started to love this art when I began to cosplay last year. I am still a newbie to say the least. So, when I found out the Belle de Jour Power Planner would be organizing an event that included makeup, I took the chance to get a slot. I just couldn't miss the opportunity to improve on my new hobby. 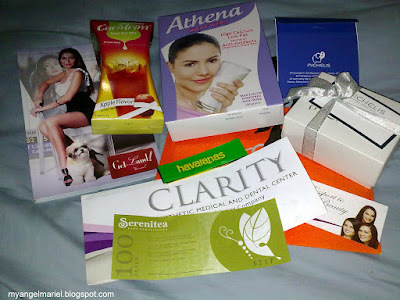 The said event was held on June 30, 2012 at the Purebeauty retail store in Serendra! I braved the bad weather just to get to the place. I was overwhelmed by the number of brands that Purebeauty sells! They're high quality and trusted brands. I saw Revlon, Clairol Herbal Essences, Two-Faced, Make Up Designory, Shiseido, and more! It was a cosmetic heaven! The Purebeauty store at Serendra. Half of the space of Purebeauty is the retail store and the other half is a small room where makeup classes of Make Up Designory is held. Make Up Designory is a prestigious makeup school in New York. Having stepped onto it's Manila branch had me feeling ecstatic! Meet our lovely host, Ms. Karen Bordador. She was beautiful in every single way: the hair, the dress, and the makeup! Plus, her positivism radiated throughout the event. Ms. Karen Bordador as our host. We had an ice breaker at the beginning of the event. We formed three groups according to our physical assets: hair, eyes, and lips. As for me... hair? nope! eyes? definitely not!... So lips it is then! :) The best part is... I won! Yay! I got a GC from Serenitea and a necklace from Michelis! Sweet! Necklace with lip pendant from Michelis. The first topic was about our hair. Speakers from Azta Urban Salon shared their expertise in choosing the right color that would fit our skin color, preference, and style. For Filipinos, as we have yellowish skin tones, it is recommended that we have warm colors for our hair. They suggested reddish and brown shades. We were also informed how to care for colored treated hair. Showing us the hair color chart. Next stop was about skin and dental care, sponsored by Clarity Aesthetic Medical and Dental Center. The speakers were Dr. Colayco and Dr. Kawamoto, for skin and dental care, respectively. Dr. Colayco introduced us to the different skin problems and how it can be prevented or solved. She told us that cleansing, applying sun block, and moisturizing is very important to our skin. It is also important to check the label and the ingredients of the products that we use. Snacks were served after. We had chocolate chip cookies from Bizu Patisserie! Five cookies were served in a cute cylindrical plastic case with ribbons! Dental care was the topic of Dr. Kawamoto. She demonstrated on how to brush our teeth properly. I have always ignored flossing. But according to her, a tooth has five sides and brushing only cleans three. I guess I would need to make flossing a habit too. Lastly, she showed us various ways on how to get that perfect set of teeth for a radiant smile! Before my favorite segment of the day, the Marketing Director of Purebeauty introduced us to the brand, their products, and Make Up Designory. All about Make Up Designory. And finally! It's makeup time! Ms. Rea Pinpin was the speaker. I am so happy to have learned from a MUD certified instructor! She taught us about the basics of makeup, sanitation, and makeup application. A lucky Bella with the name Melissa was chosen as the model for this session. We need to analyze the face before putting makeup. Melissa getting all dolled up by Ms. Rea Pinpin. Melissa after the makeup session. Wow! Hair, skin, teeth, and makeup all in one! I love this day of pure beauty at Purebeauty! I am so blessed with Belle de Jour Power Planner! All of the Bellas present went home with loot bags! My loot and my prizes from the games! Thank you to Darlyn and the BDJ girls!